When you’re pregnant, snack foods are a must! 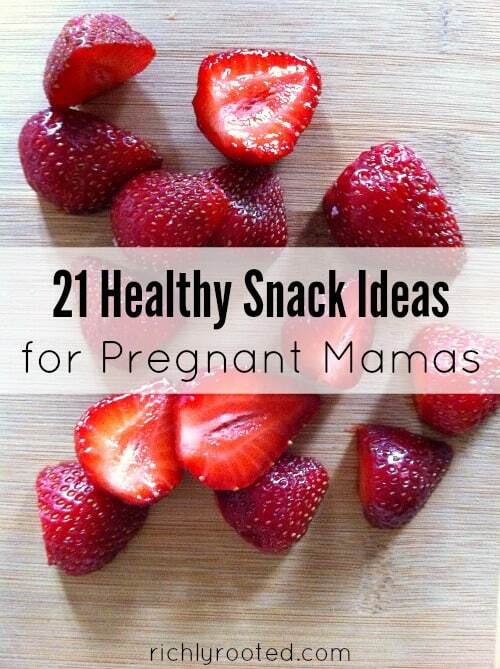 Here’s a list of 21 healthy, frugal pregnancy snacks to keep you and your baby full and happy! These snacks will satisfy your pregnancy cravings, but in a nourishing way. I’ve always enjoyed eating, but my appetite became positively hobbit-like just weeks after becoming pregnant. I read that pregnant women don’t typically gain a lot of weight in early pregnancy, but my body certainly needed the energy from calories to start building a human from scratch! Now into my third trimester, I’m not eating ginormous meals like I did during the first five months or so. My doctor explained that my stomach doesn’t have much room to expand right now. I still need plenty of calories, but I eat smaller portions more frequently, rather than packing it away in one meal. These have been my go-to healthy snacks during pregnancy. I’ve gotten tired of almost all of them at some point, but there is enough variety that I can rotate through it a bit. These pregnancy snacks are especially great to have on hand when I get those late-night pregnancy cravings and hunger pains. If you’re expecting your own little one, check out The Mama Natural Birth Course. It’s the #1 bestselling online childbirth course! It will empower you to have a healthy pregnancy and delivery every step of the way. Almonds are a great choice because just a handful will help take the edge off your hunger (one serving has about 6 grams of protein). They’re also high in minerals. When I was in the mood for a more traditional snack food, Eric bought me these! We prefer the ingredient list on these snack crackers over Goldfish. Apples fill the need for something sweet, juicy, and crisp! I also found that gala apples were a great remedy for heartburn when it kept me up one night. When I have more than just the munchies and need a truly filling snack, half of an avocado–sprinkled with Real Salt–is the perfect fix. In the same vein as apples, bell peppers provide a little sweetness and crunch. They have a lot of Vitamin C, so it’s a good snack to have on hand if colds and flu are going around! I’ll admit this isn’t a very filling snack, but they will help to tide you over until the next meal! Crackers aren’t part of our normal pantry staples, but they’ve been a lifesaver for me during pregnancy! During the first trimester, I ate them first thing in the morning to keep nausea at bay, and now I eat them regularly with cheese, hummus, or peanut butter. Aldi carries several brands that are free of high fructose corn syrup. When I’m heading out the door in a hurry, or just need an energy burst fast, a handful of salted peanuts saves the day! We buy a natural brand of peanut butter from Aldi. I smear it on crackers or just enjoy it with a spoon. For a good protein-rich, fat-rich snack, I love eggs in any form. Except boiled. I haven’t been able to do boiled eggs since getting pregnant! Fried eggs or scrambled eggs with cheese are super quick to prepare and more filling than other snacks. I use a recipe from a family friend, but you can also find good granola bar recipes in Healthy Snacks to Go by Katie of Kitchen Stewardship–or just search online for a recipe! Homemade granola bars are great because you can load them up with healthy mix-ins like nuts, seeds, peanut butter, dark chocolate, coconut, etc. This recipe makes a nice big batch! Use hummus for dipping veggies or spread it on bread or crackers. When I have the munchies but I’m not super hungry, I make a batch of stove top popcorn. I like to pop it in coconut oil, peanut oil, or leftover bacon grease and sprinkle it with Real Salt. Custard is a perfect pregnancy snack because it’s full of filling, calcium-rich milk, cream, and eggs! 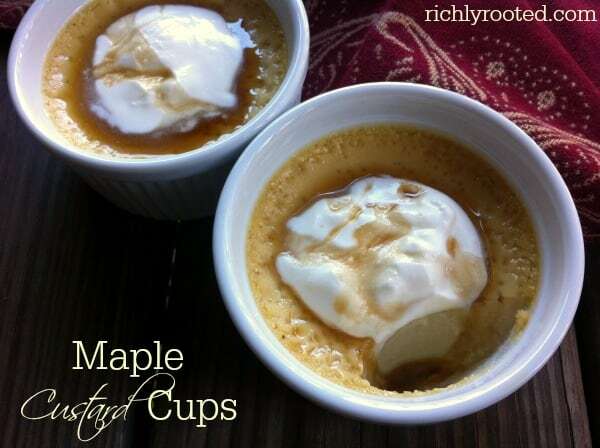 I developed this recipe for naturally-sweetened Maple Custard Cups a few months ago, and I think I could eat this every day! This Banana Coconut Pudding is a tasty dairy-free option. For a mini-meal, I love a crispy quesadilla topped with salsa! The probiotics in yogurt will keep your immune system strong! We make our own yogurt to save money and avoid additives. Sweeten to taste with raw honey, maple syrup, or mineral-rich molasses. Don’t skip on the milkfat when you’re trying to build a baby! But do try to drink milk that’s organic and from grassfed cows. We found a good brand at The Fresh Market: organic whole milk from grassfed cows that is non-homogenized and lightly pasteurized. I add a few teaspoons of raw apple cider vinegar to my water glass to give me some extra minerals and a change of flavour. I began making and drinking this unsweetened herbal tea after my third trimester began. It will help to strengthen my uterus, balance hormones, and speed postpartum recovery. We use kefir or yogurt as the base of our smoothies, then load up the blender with frozen strawberries, bananas, spinach, peanut butter, flax seed, a teaspoon or two of kelp powder, or anything else we want to add! 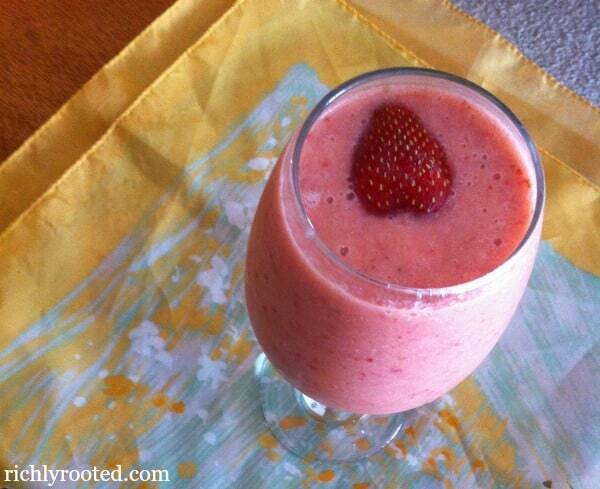 For a sweet smoothie recipe, try this Strawberry Cantaloupe Smoothie. Tell me, what snacks did you eat when you were pregnant? What are your favourite healthy pregnancy snacks? Many of the comments below refer to an earlier version of this post, where I mentioned that I ate (pasteurized) soft cheese during pregnancy, and wished I could drink the raw milk I used to get in Michigan. I revised this post to take out all references to raw milk and cheese. While I do believe that raw milk is a health food, I know that it must be carefully sourced, and that topic is beyond the scope of this post. Regarding the Brie and other soft cheeses I ate during pregnancy, I felt like it was completely safe because all soft cheeses sold in the U.S. are pasteurized, by law. This addresses the concern of listeria. In spite of my personal diet choices during pregnancy, I really respect my readers here, and y’all were very gracious in pointing out your concerns. Hence, I deleted the references to raw dairy(: But, I thought I should explain that so future readers won’t be confused by all of the comments! Great list for pregnant mamas, I have tons of friends who are expecting now…will definitely point them in your direction. You must be due really close to me! I’m 31 weeks. Great list of snack ideas! Popcorn and cheese are two of my favorites. Yes, we are due close together! I’m 33 weeks! Wow, I am impressed that you can stomach the apple cider vinegar. I can barely stomach it now, but def couldn’t have if I were pregnant. However, if I could have eaten a regular diet at all when I was pregnant, I would add walnuts and kale chips. Walnuts and kale chips are a great idea! I don’t know what next pregnancy will be like in the way of what I eat…I’ve heard that cravings and anti-cravings can really change between pregnancies! Hi Elsie – thanks for a lot of the great suggestions on this list! 28 weeks into my pregnancy I’ve been living off of a lot of these but am always looking for new suggestions! Just wanted to comment that, as you probably know, pregnant women are discouraged from consuming raw milk, unpasteurized cheese and raw honey due to listeria bacteria (dairy) and botulism (honey). It seems like you haven’t had any problems with this during your pregnancy (thankfully) and it’s totally your choice to consume but wouldn’t want another pregnant woman unaware of the potential risks associated with raw products to see this post and ultimately get sick. Maybe just a note explaining your choice and a link to potential risks would be helpful for future readers. Thanks again! Thank you for the suggestion! I will make a note about that! Probably a good idea to update your post as most pregnant moms that are unaware of these risks might not read all the comments below, be careful to give dietary advise without making sure of possible harm. Thank you for your suggestion! I did include a Disclaimer at the bottom of the post, but I’ve gone back and made it more specific! Thank you! Yes getting the ingredients in season makes a difference for sure! Awesome info. You’re Right On! Great info, will definitely be trying lots of these! Thanks. So many great suggestions! I love to see women encouraging each other to eat healthy especially in pregnancy!! I am in agreement with Kate though about precautions with soft cheeses & “raw” dairy. Find more information on why you cannot eat certain foods, especially during your 3rd trimester. I think it’s really important to be as educated as you can be about your pregnancy, so thought I would share! Most of these are fantastic ideas, but two of them worry me tremendously. Pregnant women should NOT be consuming things with raw milk in them. Listeria can be very harmful to a developing infant. That is why doctors recommend expectant moms to stay clear of soft cheeses, such as brie, and raw milk. The pasteurization helps kill any harmful bacteria (listeria). I’m sure her and her baby stayed healthy during this pregnancy, but I would rather steer on the cautious side with these items. Yes, I agree with the raw milk and Brie! I read all over the web that these snacks aren’t safe for pregnant women! Just to stay on the cautionary side! Just keep in mind that physicians do not recommend unpasteurized or raw milk and cheese products due to listeria. Listeria can cross the placenta and cause problems with baby or even miscarriage. I would check with your dr before eating raw or unpasteurized diary. Other than that this list is great! This list is great, I’m 9 weeks, super nauseous and in need of some things I can look forward to eating. I noticed you listed a few raw/unpasteurized items, which pregnant women are advised to avoid because the risk for getting listeria is higher and potentially devastating to a fetus. Hi there! I stumbled across this post on Pinterest. 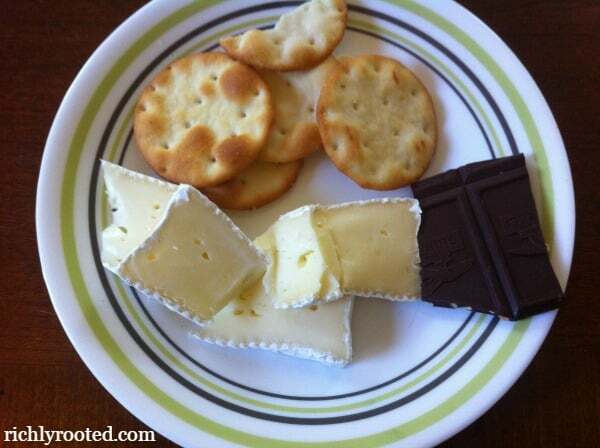 I love your snack ideas! I am also a huge cheese fan and am currently pregnant. Thank you so much! Yes, I’m still definitely interested in finding a good source of raw milk again. It’s on my New Year’s Resolutions to do! We live near Birmingham. Thanks for the suggestion! Hi! I really loved your advise. I will get some of the things tomorrow. I was wondering about the raw milk products. Here in the Netherlands we pregnant ladies arr advised not to eat raw milk products because of “listeria” . Is this different with you? Hi Elisabeth! I’m glad to have you here! I’m late in replying, so I don’t know if you’ll see this or not. It’s the same in the U.S.; mainstream advice is to avoid raw milk products. However, there is a growing demand for safe, properly-sourced raw milk, and I do believe it can be enjoyed if you do your research for a good provider! I decided to delete the parts of my post that mention raw milk because it’s too controversial of a subject to delve into here. You are not supposed to eat soft cheeses in the United States while pregnant. Soft cheeses (such as Brie, are made with unpasteurized, raw milk that may contain listeriosis. Every class and medical article will tell you that, so you really should do research before suggesting these to other women! Not only that, I saw that it was not listed, but you have a lot of pictures of strawberries. While this is a very healthy fruit, consuming too many while pregnant can cause what people call “strawberry marks”. There is something in the make up of the fruit that causes a red like mole to form on baby. I don’t know why, but I have witnessed it myself and have found it is not an Old Wives Tale. Thanks for the input! I updated the post. However, it’s my understanding that all soft cheeses sold in the U.S. are REQUIRED by law to be pasteurized! Brie and goat cheese and such weren’t traditionally pasteurized, but now they are, if they’re sold in the U.S. I’m sure Europe still sells them raw, though! Great snack suggestions, especially the smoothies! I added oatmeal to my soy milk sometimes with strawberries. Not pregnant now, but I remember being advised to slow down on my egg and cheese intake in the final months as it might give the baby jaundice- which it did indeed. But a Jamaican nurse in NICU advised sweet potatoes for milk increase and it worked. Oh, I was feeling for beet roots and lettuce with boiled eggs all the time! Odd…. Here in the netherlands (home of the cheese basically), soft cheese is fine as long as it’s pasteurized- which when sold in supermarkets is basically all cheese! Great post, Im 29 weeks and entering 3rd trimester in soldier mode. Thanks for ideas for red raspberry tea, smoothies with yoghurt and even quesadillas! Best of luck! I hope your pregnancy and delivery go well! Red raspberry tea was so helpful for healing postpartum and replenishing my vitamins and minerals. It’s also helped to keep cramping at bay throughout this whole first year postpartum! P.S. Visiting the Netherlands is on my bucket list! Great list! I’m just going into my 2nd trimester soon and I’ve had the hardest time eating. I’ll definitely be trying some of these things! I’m so glad! And congratulations! Oh, good! And congratulations on your baby! I am now expecting our second! I am up right now in the middle of the night with my pregnancy hunger and this list is great! I’m expecting my second and only a few weeks in my pregnancy but the hunger is stronger and ferocious!! Thank you for the suggestions! !